It’s Sunday. You know what that means. It’s OK to eat breakfast all day and that’s just what J and I did. When I got up at noon (yes, I’m a late sleeper), right away J wanted to go out for lunch. Hell, she drug me out of bed so we could go eat lunch. Since I was still groggy and waking up, my mind went right to breakfast food. 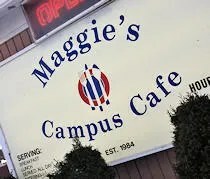 Maggie’s Campus Cafe is on Michigan Avenue just west of Howard Avenue and the Western Michigan University campus. It’s a really small building with parking in the rear. While there is an entrance in front, there’s also a back door. We walked around front not even seeing the back door. Right away, we could tell this was a joint that catered to the college crowd. You know that smell that permeates from your body the morning after drinking a little too much? Yeah, everyone in the place had the smell. It reminded me of college and my first job in TV. So many Sunday mornings where we struggled to make it to a diner for breakfast. J went to college in the city and didn’t live on campus. She missed out. The small diner was packed. There were a few people waiting in line in front of us and to make things even more crowded, you paid at a cash register right next to the front door. There was a mix of people trying to get in and out and we had no clue who was trying to do what. We waited patiently until the cashier pointed us to a table in the front dining room near the cash register. It was a four top but one of the chairs had been stolen to make a small aisle even smaller by adding a fifth chair to a different four top. Before our meal was over, the third chair from our table had been stolen too. The menus were already on the table, so we were hoping to be ready by the time the waitress came around. For a busy morning, I was actually surprised by the speed of the service. It wasn’t lightning quick, but it wasn’t incredibly slow either. Both of the waitresses looked composed and not frazzled at all by the abundance of people which I assume is an every weekend thing. J started with an Iced Tea and I got a Pepsi. After she took our drink order, the waitress asked if we were ready to put in our food order as well and we were. J went with the dish that made Maggie’s “famous.” The Breakfast Stew. It’s not really a stew though. It’s more of a hash. She got the half order of the dish which is scrambled eggs, hash browns, ham, bacon, sausage, and cheese. She asked to add peppers, but that part of the order got left off. Not a big deal since we also didn’t get charged for it. 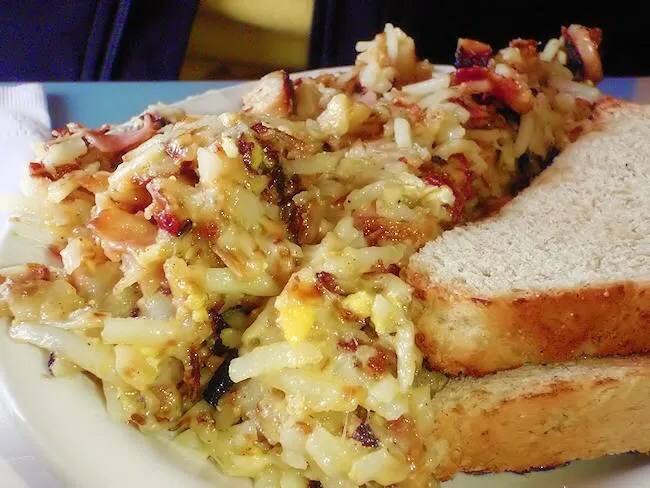 She seemed to really like the “Breakfast Stew” and compared it to the Hippie Hash at the Fleetwood Diner in Lansing and Ann Arbor. She said the real difference was the eggs. She liked Maggie’s version better because of the eggs which surprised me because I didn’t think she was much of an egg eater. The half order was even too much for her and she said she probably couldn’t have gotten two meals out of it had we taken it home. She also got wheat toast her breakfast, but she found a hair on one of the pieces and set it aside. She probably wouldn’t have eaten it anyway, but it is a little off-putting. I ordered the Walking Sandwich. They take a hamburger bun and put scrambled eggs, choice of meat (bacon) and choice of cheese (cheddar) on it. 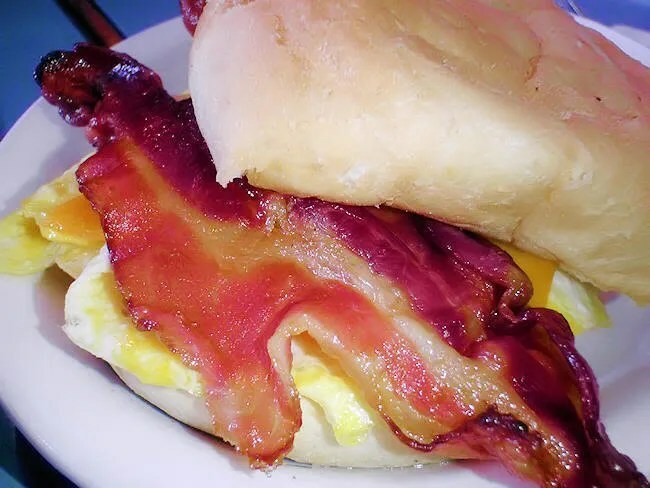 It looks a like the popular breakfast sandwiches at the large chain fast food places. My selection didn’t come with a side, but when the waitress offered hash browns, I asked for fries instead. The sandwich was good and surprisingly filling. It did taste similar to that fast food sandwich, but it was a lot bigger. The side order of fries was huge. They were steak fries and they were piled on a huge plate. Like J, I had trouble finishing everything on my plate. I did one of those things were I pushed it away and stacked another plate on top to keep me from eating too much. It didn’t work to well. The waitress did have the foresight to put our bill on the table long before we were ready for it. I really liked that she did that. We could eat at our own pace and not have to wait for her once we were done. It gave us time to look around and realize how old we are. I know my parents probably have something that they hate about my generation. With me, I can’t stand sweat pants and Ugg boots and almost every female in the place was wearing either sweats or yoga pants. J was probably the only woman in the place with jeans on and she felt dressed down when we left the house. 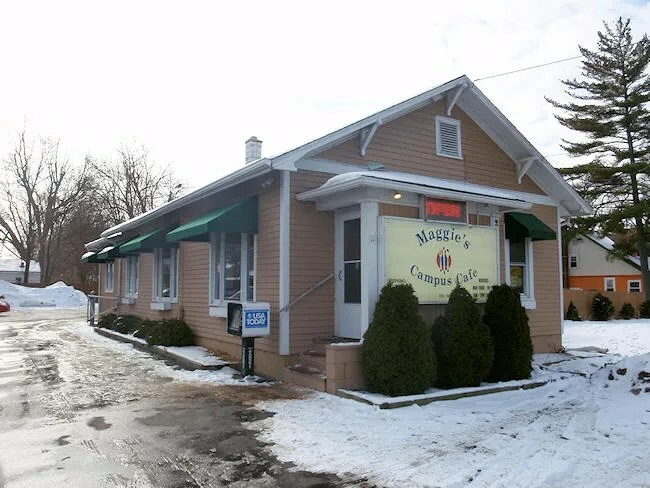 Maggie’s is the quintessential college town breakfast joint. Our meal was under $15 and we both left stuffed. They’re the kind of place that you look for in college. You can blow your week’s salary the night before on beer and still be able to afford a big, hearty breakfast the next morning. The atmosphere is a little interesting if your an old-timer, but if you’re willing to look past that, you’re not going to leave hungry. Yes! Thank you! I hope to get there soon.